The above image was made recently amongst the corn fields of north central Indiana during the cool damp fragrant moments following a seriously heavy rainstorm. 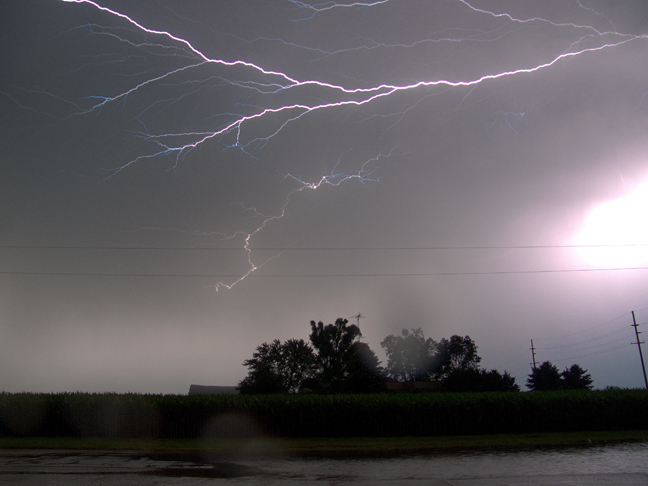 Lightning flashed everywhere, including overhead, but almost without sound. There were only slight crackles as current overloads surged through nearby power lines and residual rain pattered down. All else was silent beneath a spectacular spidering of light. That situation echoed in my mind during a conversation I had only days ago wherein there was a great deal of emotion being expressed, but very little intellectual substance. And consequently, very little constructive or even edifying communication occurred. Words seemed to lose precision. Facts were disregarded or completely remodeled. Presumptions were made that had really nothing to do with underlying or enveloping realities. The other person apparently believed that whatever her emotions were telling her was not only true and accurate, but wise and insightful. That I didn't share that presumption was extremely disturbing to her. And sparks flew. That is not a conversation I've had only once. Unlike an uncomfortable number of people, I don't consider emotions to be insightfully tailored secret messages from my guardian angel. Rather, from my point of view, though they certainly add flavor to life and aid significantly wherever empathy is required, they are in fact vague and ambiguous archaic reinforcements for behaviors that may have been adaptive or appropriate many thousands of years ago, but have only ancillary relevance to the survival imperatives we face today. Instead, I believe rational intelligence employing scientific method is far better suited to understanding and planning for the social and environmental situations confronting us now. Further, it seems plain to me the so called "wisdom" underlying emotions is so far off base that if we only listened to our emotions the human race would in very short order destroy itself and most of the environment both we and other species of this planet depend upon. Unfortunately, in today's climate of anti-intellectualism, magical thinking, and follow your bliss snake-oil salesmen, there appear to be many more souls on her side of the fence than mine. As you might guess, the residual emotion I'm left with is sadness.